Pride of the spirit is one of the five temptations of the dying man, according to Ars moriendi. Here, Demons tempt the dying man with crowns (a medieval allegory to earthly pride) under the disapproving gaze of Mary, Christ and God. Woodblock seven (4a) of eleven, Netherlands, c. 1460. Ars moriendi ("The Art of Dying") is the name of two related Latin texts dating from about 1415 and 1450 C.E. which offer advice on the protocols and procedures of a good death and on how to "die well," according to Christian precepts of the late Middle Ages. It was written within the historical context of the effects of the macabre horrors of the Black Death that occurred sixty years earlier and the subsequent social upheavals of the fifteenth century. It was very popular, translated into most West European languages, and was the first in a western literary tradition of guides to death and dying. There was originally a "long version" and then a later "short version" containing eleven woodcut pictures as instructive images which could be easily explained and memorized. In medieval Europe, art played a very important role in educating a mostly illiterate population about Christian teachings and biblical lessons. In this light, the art covering Cathedral walls and the beautiful stained glass images of cathedral windows served a higher purpose of illuminating divine wisdom and biblical lessons. These various educational art forms included the Ars moriendi among their resources as a visual way to teach the masses how to cope with death. Other cultures also contain religious texts on how to die well (the art of dying) such as the famous Tibetan Book of the Dead and the Egyptian Book of the Dead, which offer interesting parallels with the Christian Ars moriendi. The original "long version," called Tractatus (or Speculum) artis bene moriendi, was composed in 1415 C.E. by an anonymous Dominican friar, probably at the request of the Council of Constance (1414–1418, Germany). This was widely read and translated into most West European languages, and was very popular in England, where a tradition of consolatory death literature survived until the 17th century. Works in the English tradition include The Waye of Dying Well and The Sick Mannes Salve. In 1650, Holy Living and Holy Dying became the "artistic climax" of the tradition that had begun with Ars moriendi. Ars moriendi was also among the first books printed with movable type and was widely circulated in nearly 100 editions before 1500 C.E., in particular in Germany. The long version survives in about 300 manuscript versions, only one illustrated. The first chapter explains that dying has a good side, and serves to console the dying man that death is not something to be afraid of. The second chapter outlines the five temptations that beset a dying man, and how to avoid them. These are lack of faith, despair, impatience, spiritual pride, and avarice. The third chapter lists the seven questions to ask a dying man, along with consolation available to him through the redemptive powers of Christ's love. The fourth chapter expresses the need to imitate Christ's life. The fifth chapter addresses the friends and family, outlining the general rules of behavior at the deathbed. The sixth chapter includes appropriate prayers to be said for a dying man. The "short version," whose appearance shortly precedes the introduction in the 1460s of block books (books printed from carved blocks of wood, both text and images on the same block), first dates to around 1450, from the Netherlands. It is mostly an adaptation of the second chapter of the "long version," and contains eleven woodcut pictures. The first ten woodcuts are divided into five pairs, with each set showing a picture of the devil presenting one of the five temptations, and the second picture showing the proper remedy for that temptation. 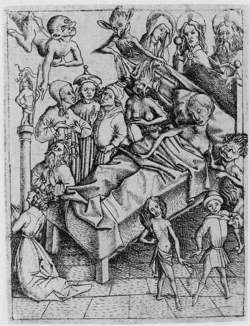 The last woodcut shows the dying man, presumably having successfully navigated the maze of temptations, being accepted into heaven, and the devils going back to hell in confusion. The "short version" was as popular as the "long version," but there was no English translation, perhaps because educated English people at the time were expected to understand several European languages. There are six extant manuscripts of the short version, most not illustrated, and over twenty extant blockbook illustrated editions, using 13 different sets of blocks. Temptation of lack of Faith; engraving by Master ES c. 1450. As well as the thirteen different sets of blockbook woodcuts, there is a set by Master E.S. in engraving. The lengthy controversy over their respective dating and priority is now resolved by the discovery by Fritz Saxl of an earlier illuminated manuscript, of well before 1450, from whose tradition all the images in the printed versions clearly derive. Studies of the watermarks of the blockbooks by Allen Stevenson at the British Museum in the 1960s confirmed that none of them predated the 1460s, so Master E.S.' engravings are the earliest printed versions, dating from around 1450. The images remain largely the same in all media for the rest of the century. There is the exceptional number of about seventy incunabulum editions, in a variety of languages, from Catalan to Dutch, the earliest from about 1474 from Cologne. Allegorically the images depicted the contest between angels and demons over the fate of the dying man. In his dying agony, his soul emerges from his mouth to be received by one of a band of angels. The need to prepare for one's death was well known in Medieval literature through death-bed scenes, but before the 15th century there was no literary tradition on how to prepare to die, on what a good death meant, or on how to die well. The protocols, rituals and consolations of the death bed were usually reserved for the services of an attending priest. Ars moriendi was an innovative response by the Roman Catholic Church to changing conditions brought about by the Black Death—the ranks of the clergy had been particularly hard hit, and it would take generations to replace them in both quantity and quality—the text and pictures provided the services of a "virtual priest" to the lay public, an idea that just 60 years earlier would have been an unthinkable intrusion on the powers of the church. Ars moriendi provided guidance to those experiencing the macabre horrors of the fourteenth and fifteenth centuries, and for those who sought to act with propriety. ↑ 1.0 1.1 1.2 N.F. Blake, "Ars Moriendi," Dictionary of the Middle Ages (1982, ISBN 0-684-16760-3). ↑ Nancy Beaty, The Craft of Dying: A Study of the Literary Traditions of the Ars Moriendi in England (1970, ISBN 0-300-01336-1). ↑ A. Hyatt Mayor, Prints and People (Metropolitan Museum of Art, 1971, ISBN 0-691-00326-2). ↑ Alan Shestack, Master E.S. (Philadelphia Museum of Art, 1967). ↑ British Library, ISTC. Retrieved November 18, 2008. Anonymous. "The Art of Dying Well." In Medieval Popular Religion, 1000-1500, a Reader. Ed. John Shinners, London: Broadview Press, 1997. ISBN 1-55111-133-0. Atkinson, David William. The English Ars Moriendi (Renaissance and Baroque, Vol 5). Peter Lang Pub Inc., 1992. ISBN 978-0820419039. Beaty, Nancy. The Craft of Dying: A Study of the Literary Traditions of the Ars Moriendi in England. 1970. ISBN 0-300-01336-1. Blake, N.F. "Ars Moriendi." Dictionary of the Middle Ages. 1982. ISBN 0-684-16760-3. Mayor, A. Hyatt. Prints and People. Metropolitan Museum of Art/Princeton, 1971. ISBN 0-691-00326-2. Reinis, Austra. 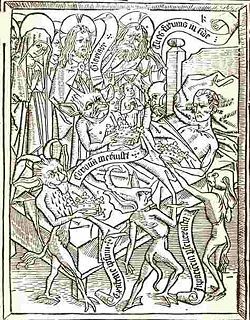 Reforming the Art of Dying: The Ars Moriendi in the German Reformation (1519-1528). Ashgate Publishing, 2007. ISBN 978-0754654391. Shestack, Alan. Master E.S. Philadelphia Museum of Art, 1967. Wils, Jean-Pierre. Ars moriendi. Insel Verlag, 2007. ISBN 978-3458173755. Eleven woodblock pictures presented in framed pairs. German language. Ars Moriendi by Douglas F. Duclow, Encyclopedia of Death and Dying. An Ars Moriendi for our Time: To Live a Fulfilled Life - to Die a Peaceful Death by Arthur E. Imhof. This page was last modified on 15 April 2016, at 15:44.